I found that actually you can change the url by reverting the post to draft. Then your post is not reachable from search engines at least for a while. It would be better if we had an option to keep old and new address in the same time or at least have a redirect option for the old link. You can 301 redirect an old url via the new feature under search settings. I don't think it would be practical to auto 301 every iteration of a URL. It is a good option but we do not have option to edit the param link for old posts. Congratulations have been a very nice feature. Of course, Blogger (Blogspot) service, the best blog in the Internet world. See above comment from Karolis Bartkus, and add a 301 redirect for the old url. I think better to shorter permalinks with other third party. 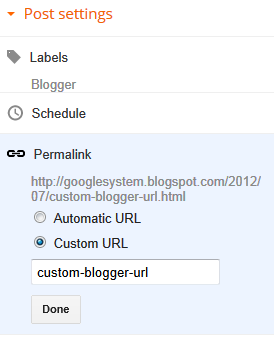 The next time you log into Blogger to write a post you will see the new permalink option in the post settings on the right of the post editor.Once you are ready to publish the post click on the permalink option. - You will see 'Automatic URL' checked with a preview of the URL if you leave it as Automatic. - Below this you will see 'Custom URL', once ticked add the words you want to be in the URL. though being forced to use new blogger ui, i find this thing randomly. finding it pretty cool option to use. thanks for sharing on how to use it. How do you change the URL of a static page? I've found the option for change the post permalink but what about a static page? You can't, but you can create a new page with a better title. Hey thanks for the response. Unfortunately right now my page URL is "/p/new.html" and when I make a new page (regardless of the title) it adds it to the navigation but just links to the main page when clicked. The "Contact CFMK" is the page I want to rename to "contact.html"
Can a custom permalink in Blogger be made after the post is published? I tried to edit the one that was automatically created, but was unable to do it. I'd love to edit all of my blog posts, since the automatic ones are ineffectual. I wanted a structure which would be like- "mydomain.com/post-name.html". But it's not possible in Blogger. I really love it and amazing information about the short url it's really good and great information well done. "Because Blogger automatically creates the URL from information from your post title, your URL would change should you decide to edit the title. This would result in broken links, and fewer visitors to your blog." Unfortunately, it is the case once again. I just updated a page and Blogger generated a new URL, breaking the links to my previous one. Which is a huge pain because I had it linked on multiple pages. Since the URLs it had generated before contained underscores I can't modify the custom URL to match the previous one. What a mess. Nice And Very useful info,This article important and really good the for me.